Free printable calendars 2016 through 2017 to download and print out on your computer 24 hours a day. 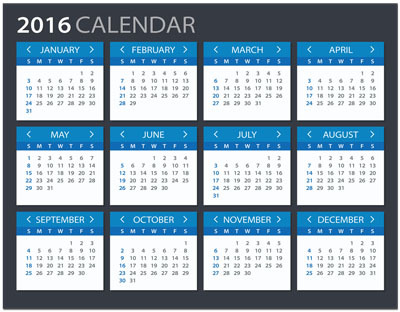 Make your own 2016 monthly calendar quickly and easily. Nothing to download, any computer will let you access our free calendars to print. Stop back every month and print out as many free online calendars as you wish online. You can download any of our Free Calendars 24 hours a day. Not only can you make your own calendar, but you may also choose to make an appointment calendar where you can type in all appointments for any day of the month and print. You also have the option of having the calendar with or without holidays shown. Otherwise just print blank monthly calendars and fill in your appointments daily or weekly. Our free printable calendars for 2016 through 2017 are in a Rich Text format so you can either print them as is or download and edit in anyway you like. Our free calendars to print are available online 365 days a year.